British drivers have blindly following their navigation systems before, but Robert Jones took it to the extreme, driving his BMW 5-series down a rocky path before a fence barely stopped his plunge off a cliff. The 43-year old Brit was heading for a friends home near Todmorden, West Yorks when the system took him down a steep and treacherous footpath. His mindless progress stopped as his car hit a fence planted at the edge of a 100 ft cliff which Jones would have probably happily driven off if his navi had told him to. 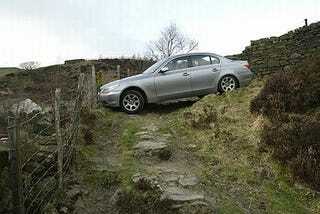 On his He-Man scale feat of stupidity, Robert said, "I just trusted the satnav. It kept insisting that the path was a road even as it was getting narrower and steeper. I rely on my satnav, I couldn't do without it for my job. I guess I'm lucky the car didn't slip all the way over the edge. But it has been a bit of a nightmare."